Point, Miss., delivered two supply vessels, bringing to nine the num- ber of offshore work boats and barges the new shipbuilder has delivered in its first year of op- eration. The Gulf Coast shipyard also announced the signing of a contract for construction of two 250-foot by 72-foot by 16-foot off- shore deck barges. Included in the recent deliver- ies were a 173-foot supply vessel for Golden Gulf Marine to be op- erated by Bosun-JMJ of New Or- leans, and a 114-foot supply ves- sel for Sea Mar, Inc. of Lafayette. The 173-foot M./V Golden Girl is the second of 12 vessels contract- ed by Golden Gulf for construc- tion by Moss Point Marine. The 114-foot M/V Cape San Bias is the second such supply boat of a two-boat contract for Sea Mar. Marine's new tilt beam launch system that is capable of han- dling up to 300-foot vessels. 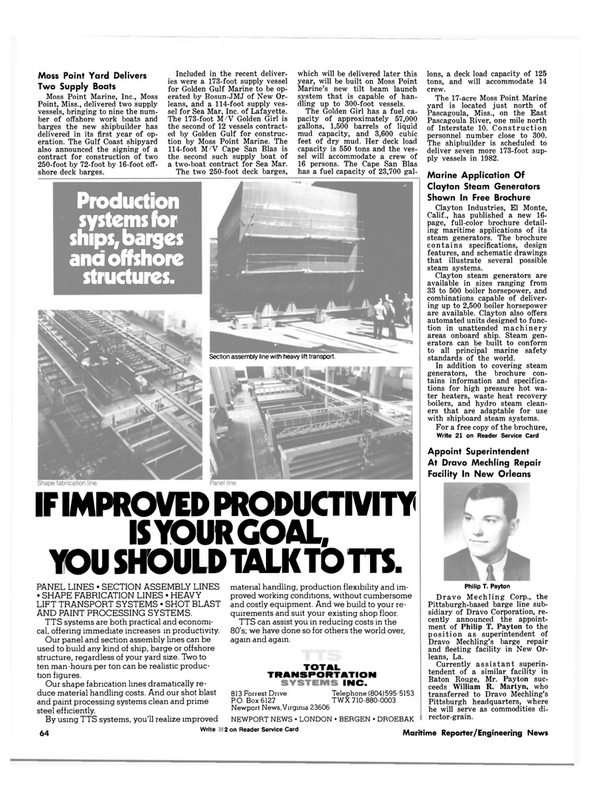 By using TTS systems, you'll realize improved material handling, production flexibility and im- proved working conditions, without cumbersome and costly equipment. And we build to your re- quirements and suit your existing shop floor. Ions, a deck load capacity of 125 tons, and will accommodate 14 crew. Pascagoula River, one mile north of Interstate 10. Construction personnel number close to 300. The shipbuilder is scheduled to deliver seven more 173-foot sup- ply vessels in 1982. Calif., has published a new 16- page, full-color brochure detail- ing maritime applications of its steam generators. The brochure contains specifications, design features, and schematic drawings that illustrate several possible steam systems. Clayton steam generators are available in sizes ranging from 33 to 500 boiler horsepower, and combinations capable of deliver- ing up to 2,500 boiler horsepower are available. Clayton also offers automated units designed to func- tion in unattended machinery areas onboard ship. Steam gen- erators can be built to conform to all principal marine safety standards of the world. In addition to covering steam generators, the brochure con- tains information and specifica- tions for high pressure hot wa- ter heaters, waste heat recovery boilers, and hydro steam clean- ers that are adaptable for use with shipboard steam systems. Dravo Mechling's barge repair and fleeting facility in New Or- leans, La. YOU SHOULD 1ALK TO TTS.